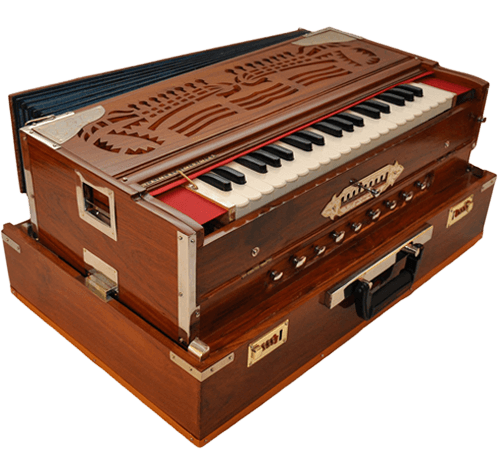 A harmonium is a keyboard instrument similar to an organ. It blows air through the air vessels (reeds), producing musical notes. The harmonium sounds like an accordion.There are two sorts of harmonium. In a foot-pumped harmonium, the player pumps a foot pedal which operates a bellows that sends the air to the reeds. A hand-pumped harmonium has a hand bellows that blows the air. It is used in music of India, Pakistan, Nepal and Afghanistan and is also used in otheŗ asian contruies. In a foot pumped harmonium both hands are free to use the key board. In a hand pumped harmoum only one hand can be used.Very skilled players pump enough air with one hand, remove it and play with both hands wherever necessary. It is used as an accompanying instruments in classical Hindustani music, Sufi music, bhajan singing, musical renditions of the classics and a variety of genres.